Travelbug winter survey. And the winner is…. And the results are in, thanks to some 17 000+ Kiwis we have a better understanding of what makes Kiwis tick on their holidays around New Zealand. Queenstown tops the polls yet again as the destination Kiwis have most enjoyed holidaying at, the resort town also came out in top spot as the place Kiwis most want to visit. Whether it’s the ski fields, neighbouring wine regions, the wide variety of tourist product of the Southern Lakes, or the stunning beauty of the place, it’s clearly a firm favourite. Thanks to some extra accommodation in Queenstown hotel rates are more competitive than they have been in the last few years, and with increased competition with domestic flights, the “$1000 return flights to Queenstown over ski season” issue is definitely a thing of the past, Air NZ have winter flights to Queenstown from Auckland one way for $99. Where else floats Kiwis boats? Areas of natural beauty such as the Coromandel, Northland and Fiordland were all high on the list, whether it’s because these places offer something a little different, conjure up great summer holiday memories, or have always been on the bucket list – they all featured highly. 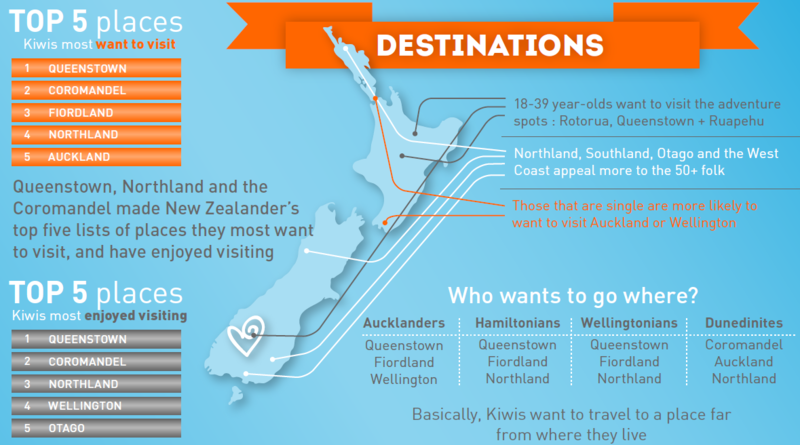 Basically Kiwis wanted to travel to a place in NZ far away from where they live. Auckland and Wellington also came up pretty highly, which was great to see. West Coasters voted Canterbury their region of choice, whether it’s because of the great skiing, and the sheer depth of things to do from whale watching in Kaikoura, the thermal hot spot of Hanmer Springs, the skiing options available – or the easy access from the coast, we were stoked to see the result. Just under 60% of Cantabs felt the city was ready to host more tourists again. We would agree with them, anyone that has visited the new pop up precinct would probably agree too – the fact is there is still a load for visitors to see and do around the outskirts of the city centre, with most of the cities tourist activities never being too badly affected by the quakes, whilst there has been a big dip in hotel rooms available, there are still some 100+ properties in the city bookable on Travelbug. Those outside Canterbury were slightly less optimistic on the city as a visitor destination with 47% feeling the city is ready to host tourists again. Recent hotel surveys completed internationally have pushed internet access as the key point people want as an inclusion, though these were typically targeting business travellers. However our research unearthed that most of us Kiwis though would much prefer something in our bellies in the morning, rather than being connected – breakfast was a clear winner with almost half of all respondents keen on a free brekkie. Unsurprisingly, younger people that have grown up in the digital age were more likely to want internet than people a few years their senior. Men also seem to want to be more connected then woman do. More and more hotels NZ wide are offering free wi-fi, especially for those that just want to check emails, as opposed to watching TV on demand. We’ve compiled a handy wee infographic that spells out some of our key findings – a few of these are in this blog, but more can be found here. We will investigate some of these further in the next couple of months.